Fun Fun Fun... I made these simple little pencil toppers just for fun, and then my 5 year old Gracie thought they would be great teacher gifts... and she's right! So here's the real quick how to... not that you need it :) Make a paper template that's just the style of triangle you think looks good! Then pin it to a double layer of felt. Sew around it on a sewing machine being careful not to sew on the paper... just around the outer edges. Leave the bottom middle open for stuffing and inserting the pencil. Clip the tree out with pinking sheers. Stuff it with poly fil and embelish it! I used sequins, silver beads, and I even embroidered on one of them! I added a felt star on one tree, and a few bows on the other two. Finally, I put a pencil in the bottom opening and whip stitched the hole closed. These plain wood pencils are pretty easy to find if you are looking for them, and they are cheap too! 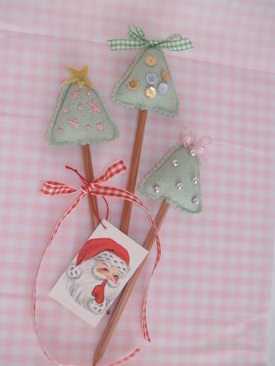 Wrap them in a cello bag, add a ribbon or a tag and have some fun with them! If you have any questions or you are new to crafting and need help, fell free to drop me a line! If you make your own, share a pic! That would be great! And if you don't craft and you want some... well you are in luck! I have them on Glitter and Grunge for $6 for a set of 3 and that includes shipping! I love this idea!! I've got to make some of these this year! Thanks for sharing them. Love this! So sweet & adorable! I found your website from Niki, and I am so glad I did. I took your pencil topper idea and revised it for Valentine's Day. I even did a little hand embroidery myself. Now my 8 year old is making a list of people in her life that need pencil toppers. hey, a very pretty and cool website. it gives me more ideas for gifts. Keep it up and i look forward to more and more!! Hey girl! Your blog looks just fantastic-luv your banner! Cute stuff here, i will have to stop in more now that I know you have one! Im so excited to here all your "tips" on stuff because Im trying to set up a pattern company, and its sooooooo much work! I can whip out the items but to actually describe how I do it-well I sound terrible, as weel, Im a crafter not a photographer so its really becoming a challenge!!! I've added you to my blog list and stores list as well.